Virga In SE NM - Severe T-Storms In West Texas. 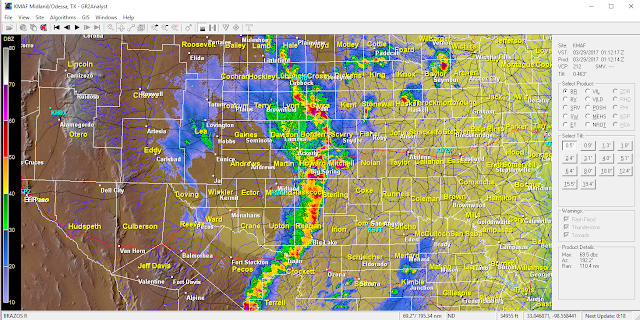 (Midland NWS Dual Pol Doppler Radar). 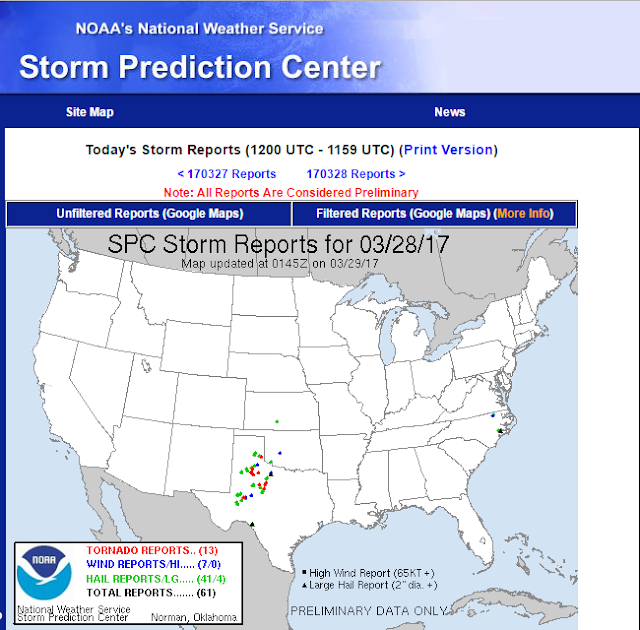 At 5:47 PM MDT Tuesday, March 28, 2017. 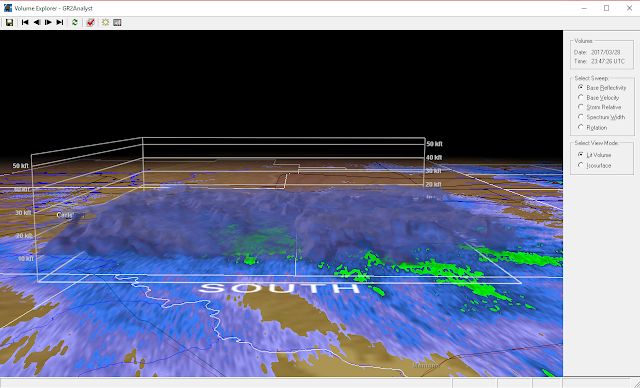 This radar software gives me the ability to dissect the internal structure of thunderstorms and view them in a three-dimensional mode. 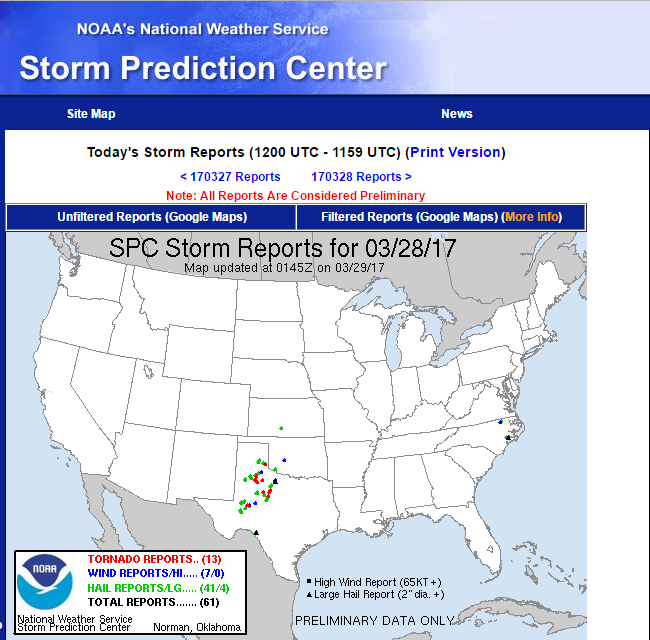 The echoes in Southeastern New Mexico were weak with tops only up to around 25,000' while the Severe Thunderstorms in West Texas were topping out near 50,000'. Very light echoes were showing up over Southeastern New Mexico and this was mostly composed of virga or precipitation falling from the clouds but evaporating before it reached the ground. This helped produce the very strong winds in south Eddy County and in Guadalupe Pass late this afternoon. 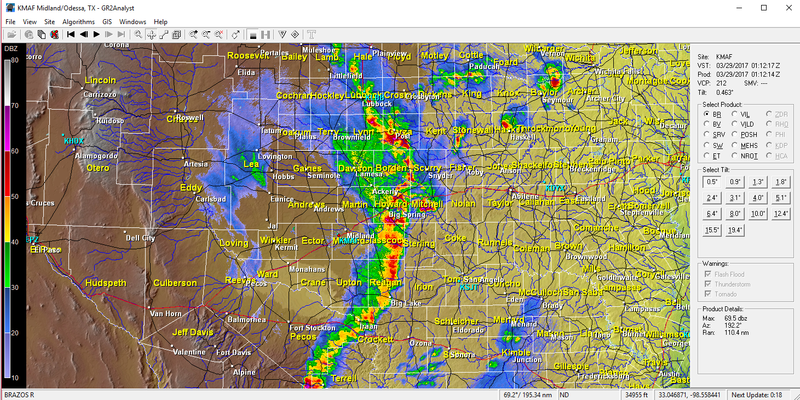 A line of severe thunderstorms firing up along and just east of the dryline was marching northeastward across West Texas at the time. 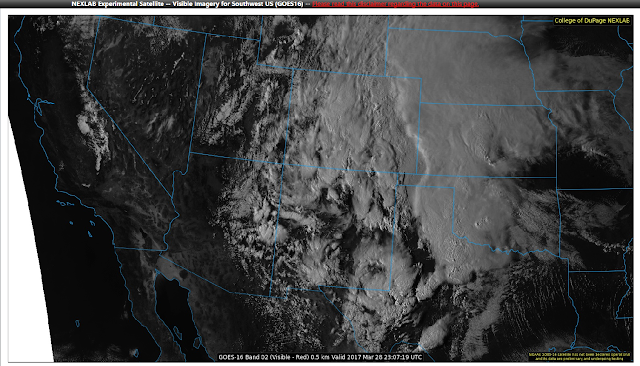 GOES16 Experimental Visible Satellite Imagery. At 5:07 PM MDT Tuesday Afternoon. This visible satellite image captures the thunderstorms erupting in West Texas and Oklahoma. 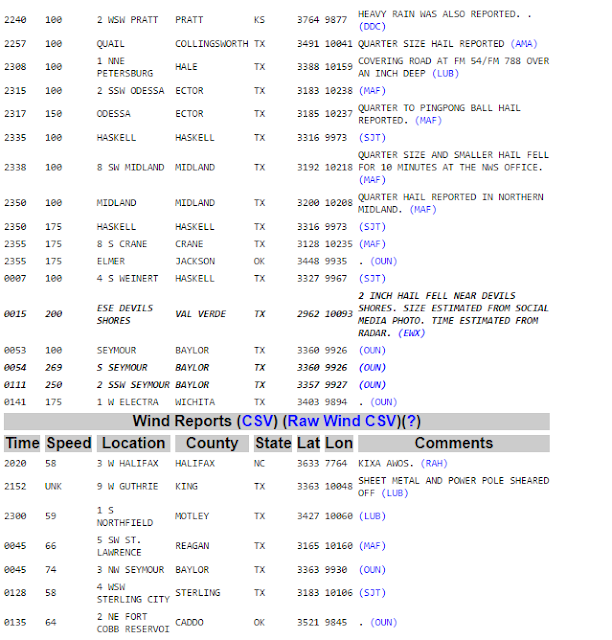 Severe Weather Reports This Afternoon. 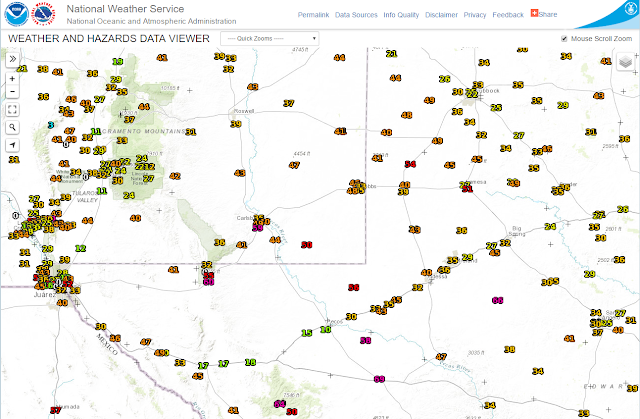 (As Of 7 PM MDT). 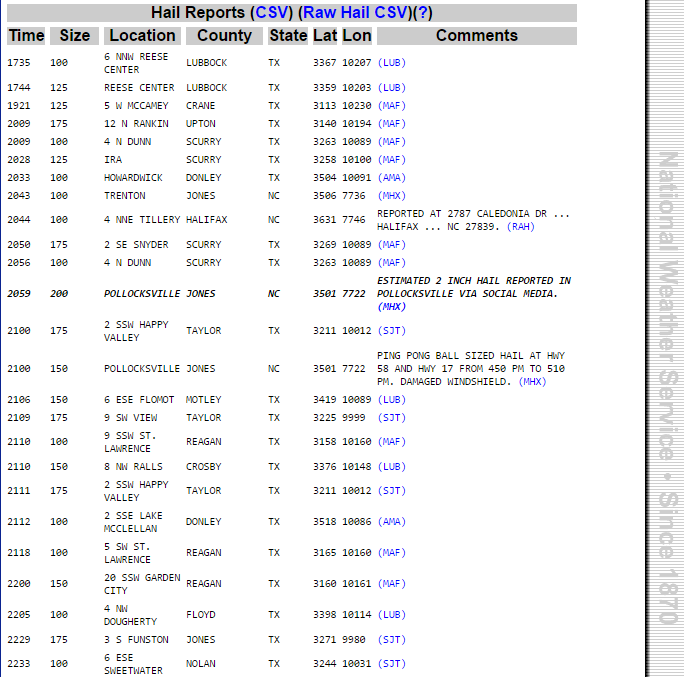 Please click on this link for an updated lists of storm reports from today's severe weather. 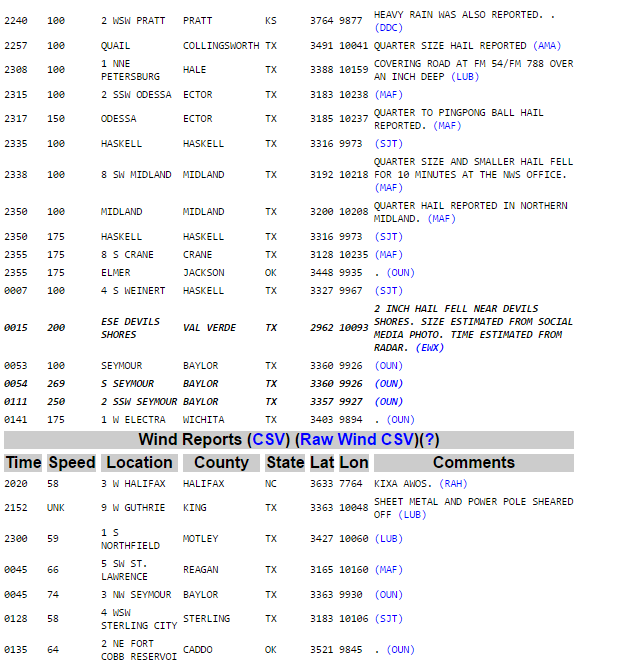 NWS MesoWest Reported Peak Wind Gusts Today. As Of 6 PM MDT. 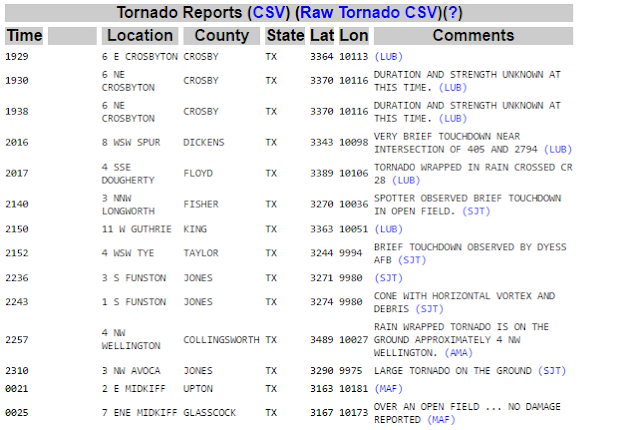 NWS ASOS Observations This Afternoon. A gust of 63 mph out of the west was clocked at the Carlsbad Airport ASOS at 4:55 PM MDT this afternoon. At the same time virga was observed over and near Carlsbad which contributed to these gusts as the rain falling from the clouds evaporated before it reached the ground but the rain cooled air from this evaporation slammed into the ground and fanned out. The Guadalupe Pass ASOS clocked a similar gust of wind out of the west-southwest to 68 mph at 5:59 PM MDT. Likely caused by virga also and the tight surface pressure gradient and the downsloping winds. • null TUCUMCARI - 0.50 in. • 8 NW ALBUQUERQUE - 0.50 in. • 3 NNW ISLETA PUEBLO - 0.25 in. • 5 S ALBUQUERQUE - 0.25 in. • 4 WSW MILLS - 0.46 in. • 3 ENE ENSENADA - 0.37 in. • 7 ENE TUCUMCARI - 0.33 in. • null FRIJOLES - 0.28 in. • 3 NNE LA CIENEGA - 0.27 in. • 1 WNW CLAYTON - 0.23 in. • 1 SSE CLINES CORNERS - 0.23 in. • 34 ESE MOGOLLON - 0.22 in. • 4 E ABO - 0.19 in. • 6 SSW SAN MATEO - 0.19 in. • 6 N TECOLOTITO - 0.17 in. • 4 SE ABO - 0.16 in. • 12 SE RIO COMMUNITIES - 0.15 in. • 3 ESE MORIARTY - 0.15 in. • 5 NW RIO RANCHO - 0.15 in. • 7 WSW ENCINO - 0.14 in. • 5 W ALBUQUERQUE - 0.14 in. • 1 WSW SEDILLO - 0.12 in. • 2 NNE QUESTA - 0.12 in. • 6 SE RIO COMMUNITIES - 0.12 in. • 6 NE LAS VEGAS - 0.12 in. • 3 ESE MILAGRO - 0.12 in. • 7 NW ZUNI PUEBLO - 0.11 in. • 4 E CANON PLAZA - 0.11 in. • 15 NW CARRIZOZO - 0.11 in. • null RATON CREWS AIRPORT - 0.11 in. • 12 SSW EL VADO - 0.11 in. • 6 NNW ALBUQUERQUE - 0.11 in. • 8 NW ALBUQUERQUE - 0.10 in. • 3 NE BONITO LAKE - 0.10 in. • 9 NW ALBUQUERQUE - 0.10 in. • 5 SSE LLANO LARGO - 6.0 in. • 8 NE ARROYO SECO - 5.0 in. • 8 SW ROCIADA - 3.0 in. • 6 WNW SANDIA PARK - 2.0 in. • 5 ESE BLACK LAKE - 0.5 in.